Although the recent teaser that Samsung has posted on Twitter only says "Intelligence from within" and contains the date of November 14, it is almost certain that this is all about the launch of the Exynos 9820 processor. This chip would make Samsung the third brand to enter the 7 nm realm, after Apple and Huawei. After the Apple A12 Bionic and Huawei's HiSilicon Kirin 980, the Samsung Exynos 9820 will soon become the third flagship processor built using the 7 nm technology to hit the market. Qualcomm is also expected to join them with the Snapdragon 8150, but its launch date is still unknown. 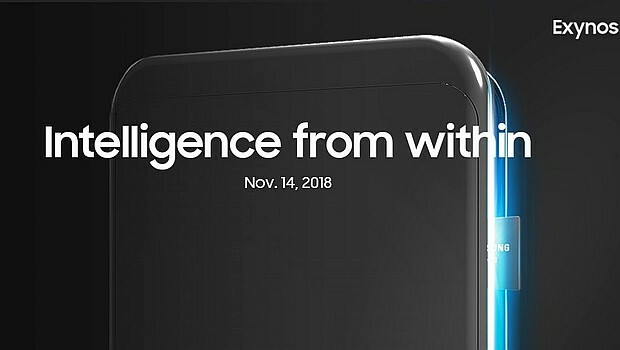 The Twitter page of the Samsung Exynos team recently posted a teaser that says "Intelligence from within" and "Nov. 14, 2018." The text message that comes with it is also rather cryptic, but it doesn't leave much room for misinterpretation, either: "Think next. #TheNextExynos"
Although it is not impossible for Samsung to launch an Exynos product that is not the long-awaited 9820 flagship processor — an AI-driven solution for the automotive market, for example — we are almost certain that the Exynos 9820 is the product that will be unveiled on November 14. The technical details are not public yet, but the new Exynos chip is expected to feature a 2 + 2 + 4 DynamIQ architecture instead of the big.LITTLE approach used for its predecessors. Obviously, the upcoming Samsung Galaxy S10 should become the first phone to use the Exynos 9820. These being said, stay tuned to find out all about Samsung's new Exynos later this week. If you happen to know anything special about this topic or simply want to make yourself heard, do not hesitate to drop a comment below.